The 2015 offseason had one main goal for the Penguins front office - bolster the forward depth. The team acquired Phil Kessel and Nick Bonino in trades, signed Eric Fehr in free agency, and looked halfway across the world to the KHL in an attempt to strengthen the roster. The team was one of the finalists for Artemi Panarin before ultimately seeing Chicago sign the talented winger and managed to sign Sergei Plotnikov to a 1 year, bonus-laden $925k deal. Panarin was widely viewed as the better player, but the hope in Pittsburgh was that Plotnikov would be a solid player in his own right and capable of earning a spot on Evgeni Malkin's line. Unfortunately for the Pens, the two Russians could not have had more different fortunes since coming to North America. While Artemi Panarin has scored 17 goals and 29 assists in 53 games playing mostly with Patrick Kane, Plotnikov has posted just 2 assists in 32 contests in Pittsburgh. While it's not surprising to see a player struggle adjusting to the North American game, the circumstances in Plotnikov's case have been unusual. While a 97.4 PDO would indicate that he's had bad luck on the ice, the breakdown shows the bad luck is heavily situated in the offensive zone. The Pens have posted a 0.933 SV% with Plotnikov on the ice with only a 4.0 SH%. While the team has posted a similar save percentage with Plotnikov off the ice (0.936 SV%), the shooting percentage jumps to 6.3% without him - and even then the Penguins have been among the league's worst in shooting percentage this season. The level at which the team is shooting with Plotnikov cannot be explained by just one player alone. The exact opposite has been true about the team's possession with Plotnikov. He's posted a 53.4 SACF% this season in 32 games, which is even more impressive considering the Pens posted a 49.5 SACF% with Plotnikov off the ice in that time span. He's been better in score-adjusted scoring chances (54.2% on vs 51.2% off), high danger scoring chances (53.7% on vs 50.9% off), and Fenwick (53.8% vs 49.8%) - everything except for goal scoring (40.0% on vs 64.8% off). Problem is, even his possession numbers have been enigmatic. Yes, enigmatic and a Russian player in the same sentence. Usually it's a cliche, but in this case it's very much applicable. It's no secret that the Penguins have been a much better possession team under Mike Sullivan than they were under Mike Johnston as the team's improved to a 54.7 SACF% under the new coach from 48.3 SACF% under the old coach. 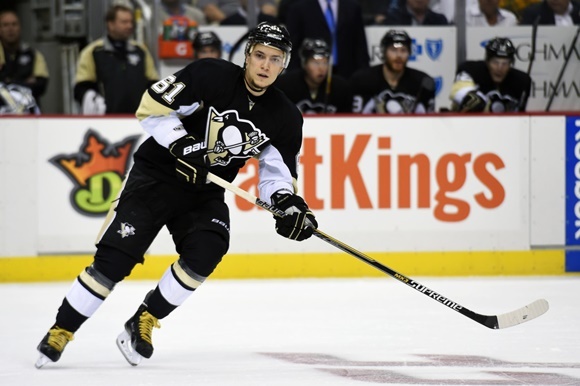 It's a massive turnaround that once again sets Plotnikov apart from his teammates. Under Johnston, Plotnikov posted a 55.9 SACF% over 28 games while the team managed only a 47.8 SACF% over that span with Plotnikov off the ice. It's been the complete opposite under Sullivan, where the Pens have been much better with Plotnikov off the ice (53.0 SACF%) than with him on the ice (48.6 SACF%) in the 10 games he's played. At this point in time, the Penguins just don't know exactly what they have in Sergei Plotnikov, and they don't seem particularly interested in finding out. Given his low PDO and low on-ice shooting percentage, it's likely that he would rebound with greater offensive production with more ice time. He's the one player on the team that was thriving possession-wise under Johnston and the one player who has fallen dramatically in possession under Sullivan. Does he just not have the offensive talents to hack it in the NHL despite being a productive player in Russia? Are his possession numbers under Johnston or Sullivan more indicative of his true ability, and what's different about him than the rest of the team? Are either or both just a result of small sample size? Is it a reflection of the changes that Sullivan made, and does that make him a bad fit or someone struggling to adjust? He's been healthy scratched for 10 of 20 games under Mike Sullivan including the last 8 straight at a time when AHL callups have regularly been in the lineup. It behooves everyone involved to send Plotnikov to Wilkes-Barre to see if he can bust out of the scoring slump and answer these questions at the AHL level. The lower level of competition and increased ice time could be just what Plotnikov needs to get more comfortable with the smaller rink, or it could just reinforce what management has seen throughout the first half of the season. Either way, it's better than just stashing Plotnikov in the press box and chalking it up as a failed chance without giving him an opportunity to rewrite the narrative.